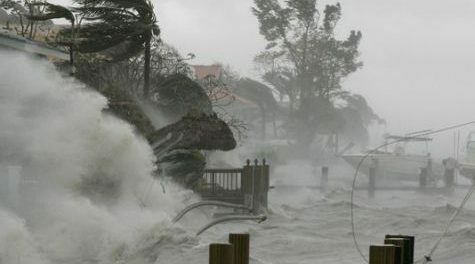 The Atlantic ocean could see another above-average hurricane season this year, with 11-17 big storms and as many as nine hurricanes, US forecasters said Thursday. The expected absence of El Nino, an ocean-warming trend that tends to reduce the likelihood of hurricanes, is a major reason for the expected rise in number of storms. Other factors include above-average sea surface temperatures and weaker vertical wind shear across the tropical Atlantic Ocean and Caribbean Sea. An average season produces 12 named storms of which six become hurricanes. “The outlook reflects our expectation of a weak or non-existent El Nino,” said Gerry Bell, lead seasonal hurricane forecaster with the National Oceanic and Atmospheric Administration’s (NOAA) Climate Prediction Center. The upcoming Atlantic hurricane season runs from June 1 through November 30. “Forecasters predict a 70 per cent likelihood of 11 to 17 named storms,” said NOAA, referring to tropical storms with winds of 39 miles per hour (63 kilometres per hour) or higher. Five to nine of those storms could become hurricanes, with winds of 74 mph or higher. Two to four hurricanes are expected to be “major,” meaning Category 3 or higher, with winds of 111 mph or more. Already, the eastern Atlantic has seen a rare, pre-season storm, Tropical Storm Arlene, which formed in the eastern Atlantic in April.